Cutting or drilling floors in factories, schools, shopping malls or any regularly remodeled facility without a scan or 'x-ray', as its known in the industry, first can be a dangerous and potentially expensive proposition for any contractor. 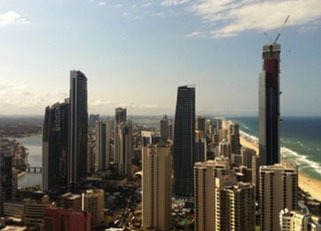 The facility owner as well may be exposed to down time and severe disruptions should a forgotten utility be destroyed. With a scan or 3d image to work off, knowing the location will allow the contractor to work around and avoid disruption of these utilities. 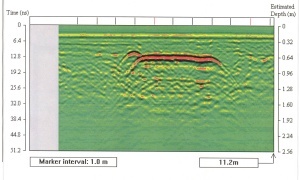 Pin point accuracy of coring can be achieved with 3d imaging. Power cable detection can also be achieved to provide utmost safety in all cases. As you can imagine, it is vital that no damage occur to post tension cables or structural integrity of the building will occur. Post tension cables contained in a concrete floor can be located and contractors directed on safe drill or cut options allowing the contractor to avoid potential hazards. 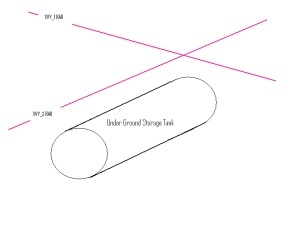 In the above image, the thickness of over burden covering this area of buried debris can be quickly determined as approximately 0.9 meters. Determining the thickness of over burden can be a significant benefit in many applications. One example would be determining the volume needed to be excavated of an undesirable material. Also you could determine the volume of bed rock or material needed to be removed before excavation. A significant clay layer might be of interest and in the area. 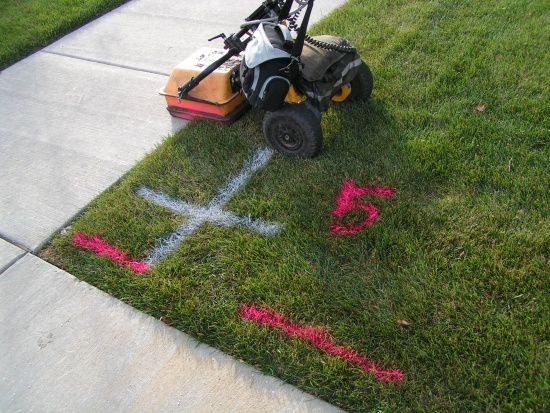 All of these and more can be determined using our GPR equipment. 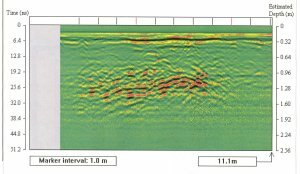 There is a significant benefit using GPR, as GPR data is collected either in 3-d or continuous cross sections rather than just one point. 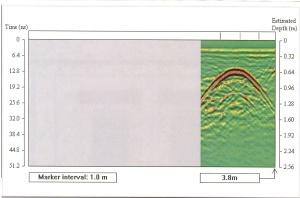 Locating clandestine under ground storage tanks is a very typical application for GPR which is being able to mark out the precise location of a deteriorating tank is very important prior to drilling or excavating operations. The top measurements were observed when passing over a cross section of the U.S.T., and the lower ones were produced during a longitudinal scan. 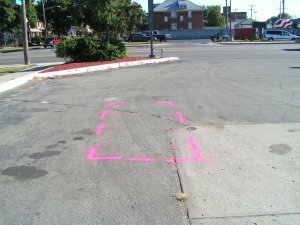 The precise location is marked on the surface normally with marking paint. Leaving little doubt as to the identity or position of the target. 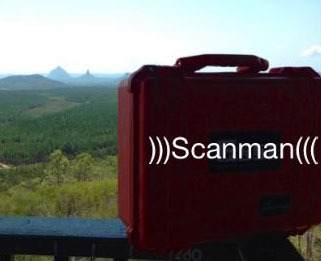 Whether you are drilling for soil samples or core drilling in concrete slabs, we can scan an area around the bore location and quickly determine the presence of utilities, reinforcing or other structures. A real issue in today’s crowded and aging cemeteries is whether or not there are plots that could be sold. 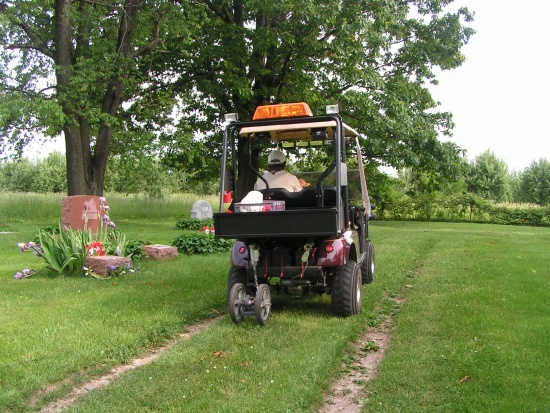 Documentation in many older cemeteries is limited at best and may not be very reliable. 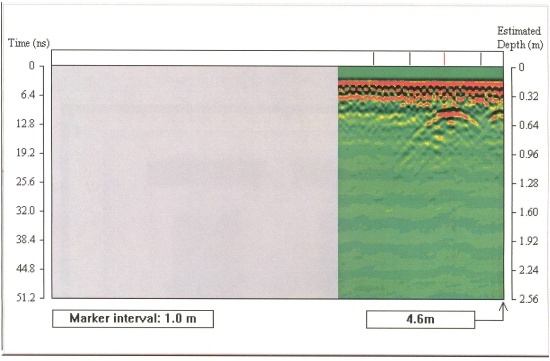 GPR scanning has determined the existence of “unoccupied” plots, freeing these areas to be sold. One of the questions we are asked regularly is whether or not our equipment will find subsurface targets under building slabs with reinforcing. The answer is yes most of the time. As long as the reinforcing is normally spaced, we can “see” under it. Here are a few photographs of areas anomalies were identified under building slabs.